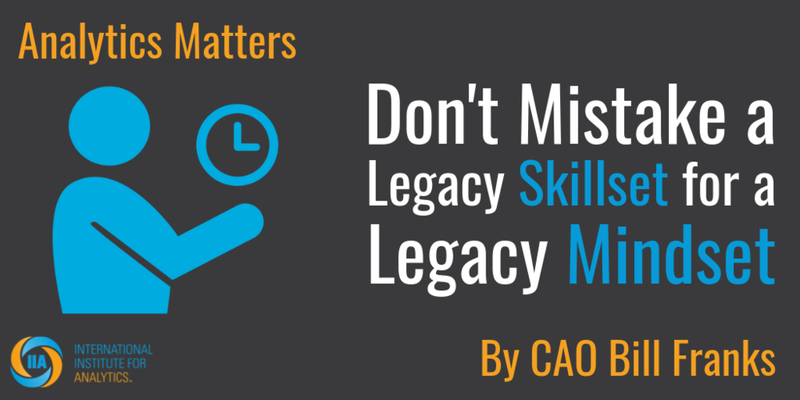 WHAT IS A LEGACY SKILLSET? Data experts who are only familiar with classic client-server Extract, Transform, and Load (ETL) tools working against raw files and loading into a database. Business intelligence and reporting experts who only know traditional reporting suites and have never worked with visualization tools, open source tools, or web-based delivery approaches. Advanced analytics experts who are still confined to the world of SAS and SQL working against a traditional data warehouse and have never worked in a cloud environment or with open source tools like R or Python. It is important to note that I am not implying that the skills above are no longer needed and no longer have value. These skills absolutely have value today and will in the future. It is simply that these skills are necessary, but no longer sufficient, in today’s world. People must add more skills to their resume to continue to have maximum impact. The fact that organizations still need these legacy skillsets does not mean that those skills don’t need expanding. WHAT IS A LEGACY MINDSET? A legacy mindset is a mental attitude and outlook. It isn’t directly tied to legacy skills, though the two can overlap within the same person. A legacy mindset is present when an individual doesn’t desire to change how they do things and isn’t interested in learning new skills. A person with a legacy mindset is perfectly happy to keep plugging away in the same way they always have regardless of how the world is changing around them. In a few cases, an employee may be trying to get by for just a few more years before retirement. In most cases, an employee is simply resistant to change and desires to stay in his or her comfort zone. It should go without saying that having a large cohort of employees with legacy mindsets is not conducive to moving an analytics organization forward. It is critical to jolt those with a legacy mindset into a new way of thinking to avoid shrinking productivity and effectiveness over time. Lacking success jolting the employees, it may be necessary to move them out of the organization over time. Now that we’ve defined the difference between a legacy skillset and a legacy mindset, let’s look at how to deal with them. As stated above, the worst approach is to assume that there is 100% overlap between the two. That is not the case. Making that assumption will lead an organization to push out (and then have to replace) many more people than necessary. There are clear direct costs to this. In addition, the people who are needlessly pushed aside will not be getting fair treatment and the organization will lose access to their accumulated institutional knowledge. In reality, many people with a legacy skillset do not have a legacy mindset. They will be happy, if not eager, to learn new skills and update their resumes. There are certainly some costs related to the training and learning curve such employees must go through. But, those costs will be far less than wholesale replacement of a team. In the worst case, organizations raise costs significantly by retaining current employees to perform legacy roles and hiring new people to modernize. Why not let some people help with both instead of doubling headcount? In reality, employees lacking a legacy mindset are probably experimenting on their own already, whether at home or on the side at work. They may be immersed in a job that mostly requires legacy skillsets today, but they are ready, willing, and able to move beyond that if given the chance and the charter. The solution, therefore, is to assess employees on two dimensions: their skillset and their mindset. Identify those whose skills may be behind the times, but who have the right mindset. Then, give them the chance to step up, improve their skills, and move the organization’s analytics and data science program forward. Your current organization may have more potential than is being recognized!